An auto loan application is designed to determine both your ability to pay and your likelihood to pay. Your ability to pay relies on your income and financial obligations. Your likelihood to pay is determined by your performance on past debts, also known as your credit. These factors will all be used to determine both if you should get a loan and what the terms of that loan should be. 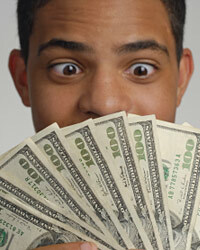 Your income must be high enough to cover the cost of monthly payments. As a result, the lender will ask you to state your income when determining the size of your loan. Often, stated income is not sufficient for the lender. You may be asked to provide proof of income through a tax schedule or a paycheck stub. It is best to have consistent employment for at least two years before seeking a loan. This helps the lender determine if your income is not just high enough, but also sustainable over the period of the loan. Students and recent graduates will have the hardest time meeting this requirement, but they may receive certain specialized loan products in order to compensate for lower salaries. Income does not exist all by itself on an application. You may have a very high income but also have a lot of debt. In this case, you will have to meet multiple debt obligations each month, not just pay our auto loan. Your debt payments will affect how much you can afford to pay towards an additional loan, and your lender will want to know your debt obligations as a result. Debt obligations are often stated in a credit report, but you may be asked to additionally provide this information on your application. The lender will then compare your total income to your total debt to determine how much you can truly afford to pay. Your credit is a measure of your performance on past debts. If you have never taken a loan or have no debt, it does not mean your credit is necessarily good. You have to actually have a history of credit in order to have a high credit score. Before taking an auto loan, you should have taken out credit cards and other small loans. Making monthly payments and paying down debts on time will build your credit. Your total performance is measured by a single number, your credit score, which is accessed through a credit check. You may be asked to provide references on your car loan application. This is more common for low credit or low income borrowers, but any borrower may find the requirements. You can typically provide both character references and professional references. Character references include individuals who know you personally and can vouch for your honesty. Professional references, like your employer or a previous lender, can vouch for your responsibility in professional relationships. You may be able to use a previous landlord as a professional reference that can speak to your ability to make monthly payments.